Is the USA Fueling Crises as Negotiation tactics? The United States is doing its best to estrange the European Union from Russia to get the upper hand in a free trade deal, and also, to manipulate European countries into buying America’s relatively more expensive natural gas. The Trans-Atlantic Trade and Investment Partnership (TTIP) is a Euro-Atlantic free trade agreement that is the subject of ongoing negotiations between the US and the EU. The deadline for finalizing the TTIP free trade agreement is in 2015. Its goal is to create what is referred to as the Trans-Atlantic Free Trade Area (TAFTA) and to cement the European Union with the United States as one supranational trading bloc. These trade negations have been passing under the public’s radar, because they have been taking place very discreetly behind closed doors. The very TTIP’s name is designed to conceal, and was selected by policy and trade mandarins, because of their fears that a public backlash could erupt against the negotiations, as it did in the case of the Free Trade Area of the Americas (FTAA) talks in 2001. Like the Comprehensive Economic and Trade Agreement (CETA), which was signed in Ottawa between Canada and the EU on September 26, wordsmiths calculatingly picked the name TTIP to try to hide the fact that it is a free trade agreement. Washington is doing its best to disrupt trade ties between its EU partners and the Russian Federation in order to get greater leverage in the TTIP negotiations. Its strategy is to economically weaken its European partners by getting them to cut ties with Moscow through anti-Russia sanctions that will directly hurt their economies too. Washington calculates that this will force a weakened EU to maximize the economic concessions to the US in the TTIP talks. Geopolitically, this is a story about Euro-Atlantic (read Euro-US) integration versus Eurasian (read Euro-Asian) integration. It seeks to reduce Russian influence in the EU and any risks of the strengthening of trade ties between Russia and the EU by trying to marginalize the Russians in Europe. TTIP negotiations have intensified because the US wants to amalgamate the EU with North America, because it fears that countries like Germany could start considering a Eurasian alternative involving Russia and the Commonwealth of Independent States (CIS) in the post-Soviet space. The crisis in Ukraine precisely serves America’s dual purpose to weaken both the EU and Russia. It seeks not only to expand NATO and encircle Russia, but also to damage EU-Russia ties. Ukraine is literally being exploited and used by the US to create a rift between Moscow and the EU and to portray Russia as a bogyman and threat to European security. The US has also been fighting an energy war that involves controlling energy reserves, the pipelines, and strategic corridors that energy is transported through. US involvement, commitments, and concerns in the Balkans, the Caucasus, Central Asia, Iraq, the Levant, the Persian Gulf, and Ukraine have all been part of this energy war. Shale gas and hydraulic fracturing of gas is part of this equation too. Fracking is transforming the US, which has the fourth largest shale gas reserves in the world, into a natural gas exporter. Washington plans to begin exporting gas from North America in 2015 and 2016. At the same time, the US has been using North American integration to strengthening its hold on Canadian energy resources. Canada is one of the largest producers of natural gas, largest possessors of proven oil reserves, largest producers of crude oil, and possesses the largest shale gas reserves, and, on the whole, is one of the top energy producers in the world. In the context of US energy exports, Washington wants to compete against and even sideline Russia in the natural gas market. For that reason the US has been lobbying the EU and Turkey to stop buying gas from Russia’s energy giant Gazprom and, instead, to begin importing it from the US. The objective of pushing Russia out of energy markets has been part of a long-term US strategy that has been heavily discussed in the Washington Beltway before the US even invaded Iraq in 2003. American gas, however, is much more expensive than the Russian since it has to be fracked, liquefied, and transported at much higher costs. The American liquefied natural gas (LNG) does not have any chance of competing against Russian gas exports to Europe under fair circumstances and in a genuinely free market. The so-called free market, however, is not-so-free. There has always been political manipulation taking place to give an advantage to the corporations and conglomerates that certain governments wait on. Instead of competing fairly in the EU energy market, the US has been working hard to eliminate Russia as a competitor by getting Brussels to simply cut its energy ties with Gazprom and the Russian energy sector. This is precisely why the US has pushed the EU member states to impose sanctions against Russia and in this way put legal restrictions and barriers to buying Russian gas. In context of the energy war, a Polish LNG terminal has been setup in the Baltic port of Swinoujscie with plans to receive its first deliveries of natural gas from North America by the end of June 2015. 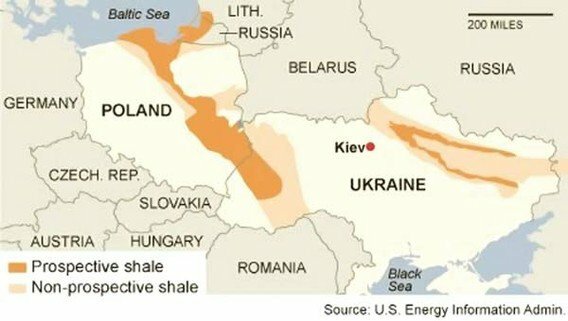 Poland and Ukraine are both seen as important possessions for the US in its quest to dominate the gas trade. The two countries have the second and fourth largest shale gas deposits in Europe—if you exclude Russia, their respective reserves are the first and third largest in Europe. The US has plans to control the large untapped shale gas reserves in both countries. Major US oil companies Chevron, ConocoPhillips, ExxonMobil, and Marathon Oil—which operates in Iraqi Kurdistan and is a shareholder of post-Jamahiriya Libya’s Waha Oil Company—have all got huge stakes in exploring and developing Polish shale gas. Ukrainian President Viktor Yanukovich’s government had signed a deal with the Anglo-Dutch energy giant Royal Dutch Shell to explore and drill for natural gas in East Ukraine in January 2013 with zero taxes. Another agreement was signed in November 2013 between Yanukovich’s government and Chevron to also explore and develop the energy reserves in West Ukraine. Just a year earlier, in 2012, Kiev also awarded a gas contract off the Crimean coast to a consortium led by ExxonMobil and Royal Dutch Shell to develop the Skifska gas field. 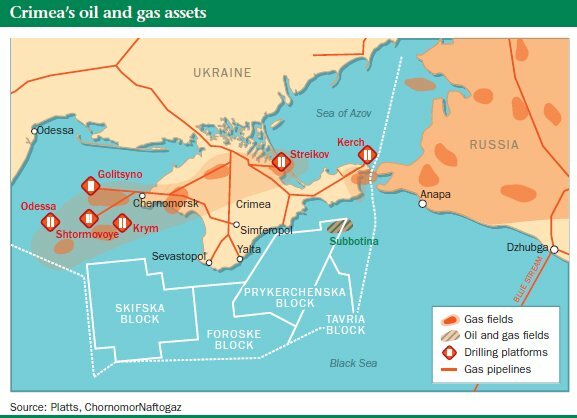 The Skifska gas field is not the only field off the Crimean coast that US oil and gas corporations were interested in. Next to Skifska are located the Foroska, Prykerchenska, and Tavriya fields. While Prykerchenska field was awarded to the US offshore company Vanco Prykerchenska Ltd. and Foroska was under the management of Chornomornaftogaz, the Foroska and Tarivya fields were both the subjects of continuing discussions. In part, US hostilities towards the rebels in East Ukraine are tied to protecting the shale gas concessions that American energy corporations have received from Kiev. Andrey Purgin, the Deputy Prime Minister of the self-proclaimed Donetsk People’s Republic, has even stated that the same US tactics that were used in Iraq, which include the calculated destruction of civilian infrastructure, are being applied in East Ukraine. These US operations are run via proxy “soldiers of fortune” or mercenaries and “hired guns.” According to a May 2014 report by Germany’s Bild am Sonntag newspaper, the ill-famed US private security firm Academi, which has renamed itself from Blackwater and Xe Services owing to its awful record in Iraq, was unleashed on Donetsk and Lugansk. The Energy War and Syria: Mediterranean Lockout? The situation in Syria, where the US has deliberately been destroying energy infrastructure under the mantra of fighting the ISIL, can also be viewed from the same prism of petro-politics. The natural gas fields off the Levantine coastline that encompasses Syria, Lebanon, Israel, and Gaza hold immense reserves of natural gas. Here too the US is working to push out Russia and to control the gas reserves in the Eastern Mediterranean. Since 2000, Russian engineering construction company Stroytransgaz has been active in Syria and received contracts to build two gas refineries in the Homs area and to construct the Syrian portion of the Arab Gas Pipeline that connects Lebanon and Syria to Jordan and Egypt. Another Russian energy company, Soyuzneftegaz, got a tender from Damascus to operate on its eastern border with Iraq in 2004. In 2007, the Syria Gas Company (SGC) and Stroytransgaz agreed to jointly work on developing the natural gas reserves discovered in the fields of Homs. Amidst the crisis in Syria, Soyuzneftegaz signed an important offshore exploration agreement with Damascus on December 25, 2013. Moreover, it just so happens that the crisis in Syria erupted during negations between Syria, Iraq, and Iran to build a gas pipeline from the world’s largest natural gas field to the Syrian coast. Damascus signed the agreement with Iraq and Iran on June 25, 2011. Until the contract was cancelled in 2009, Stroytransgaz was even supposed to connect the pipeline between the oil-rich city of Kirkuk and the Syrian port of Baniyas. Qatar and Turkey were hostile to the Iran-Iraq-Syria gas pipeline agreement since it sidelined them as a natural gas exporter and as an energy corridor. The possibility that the Iran-Iraq-Syria pipeline could be used to export gas to the EU as a lower-priced rival to US LNG also had to be viewed negatively in Washington. What the fighting in Syria and Iraq has done is put this project on hold whereas regime change will nullify it. Destabilization as US Bargaining Tactic? While the US has been stoking tensions in Europe to help it in the TTIP negations with Brussels, the Pentagon has been redeploying to the Middle East. 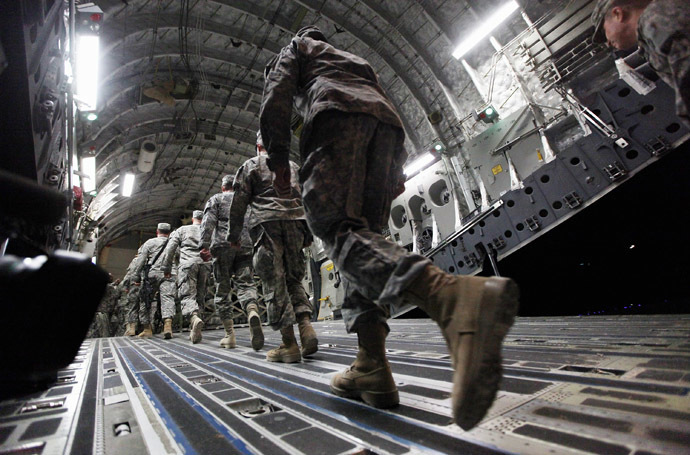 The Pentagon-led buildup in the region is about anything but fighting the ISIL. In part, it may be tied to US nuclear negations with Iran. On top of other goals, the US-led military buildup could be intended to give Washington additional leverage against Tehran in the nuclear talks. Creating instability looks to be part of a packaged approach. Whatever the case is, its creation appears to be used to support US negotiations and bargaining. This is very clear in the case of the tension in Ukraine, where Washington is using the crisis to its advantage in TTIP talks and to peddle its LNG to the EU by using sanctions to lockout Russian gas. This article was originally published by Russia Today (RT) on October 8, 2014.